Does Size Matter in Dry Rubs? 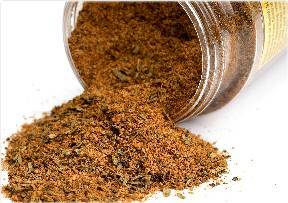 Much has been said about the size of Dry Rub granules when considering a dry rub for purchase. Our overriding belief is that a medium sized granule is fine but the real question is whether or not it works together to create flavor. So, we offer our view and hope that no matter what size you choose it delivers the results you were hoping for. Our Tri-Tip, Steak and Rib dry rub seasonings are made with the finest ingredients that are granulated to a medium course consistency. Results from hundreds of grill tests prove that medium course spices when properly prepared with complements of brown sugar, pepper and paprika impart more flavors to the meat, a difference not only which you can taste but see. Fine spices which adhere to the meat tend to clump and gather too much of one ingredient in one location. Our Medium Course Tri-Tip Rub imparts more flavor and enhances the quality of the meat which is after all why one buys a dry rub. Jake's dry rub seasonings are perfectly blended collections of the right spices and seasonings designed to give you a smooth even taste no matter where you bite. Some claim that spices can either be burned off or fall off the meat at grilling. We've noticed first hand how this can happen. But we've also noticed that in each case when it happened the griller added the spices and went directly to the grill. Good spices are designed to blend perfectly with the juices of the meat adhering over time, imparting the richness of the seasoning. No dry rub whether fine or course will leave a meaningful impression if shaken on and place over a roaring fire. The secret, "time," allow the seasonings ample time to do their work. Consider preparing the meat 1-2 hours before or overnight. The result will have you smiling. And last but not least a great dry rub will do two things 1) combine with the meat juices to form a crust that contains tremendous flavor 2) have you coming back for more. Anyone who has ever purchased Jake's Tri-Tip, Steak and Rib Rub Dry Seasonings knows that the flavor is unmatched and although some will sell for less, less is what you're actually getting. Who really wants to skimp when their presenting their best barbecue?